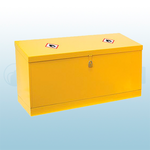 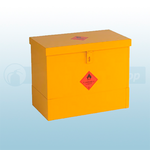 Available from the Fire Protection Shop are hazardous substance bins that have a 50mm lip and complies with the Highly Flammable Liquids and Liquified Petroleum Gas Regulation 1972 and, where appropriate, the Health and Safety Executive Guide HSG51 and DSEAR 2002. 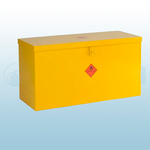 The storage bins are constructed from 20-gauge mild steel with a durable, epoxy-polyester, powder coated finish and clearly labelled with 'highly flammable' hazard warning diamonds. 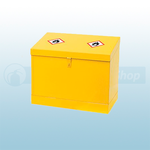 The bins can either be purchased with a sloped or flat lid.